There is something so chic and simple about stripes and I'm all about simplicity when it comes to my style. When I shop for clothing, I try to buy pieces that are timeless and can be worn multiple ways. Case in point, my orange clutch which I've been using non stop since I got it. The bold color instantly brightens any outfit and it seems to go with everything in my closet these days! incredible outfit again! loving that big clutch with great color. and the little ring looks so cute. perfect outfit! I love this outfit and your ring! I really like that green right now. Great blog! I am a new follower! Maybe we can follow each other? Love this look, stripes are most definitely timeless and chic! I am glad you stopped by my blog, you have fantastic style (loved that Elizabeth and James black skirt!) and I am now follwing! which could match with everything in our wardrobe. I really like that outfit, specially your shirt and your clutch. French is my mother tongue, sorry for mistakes;-) If you want we could follow each other. xoxo from another style lover in Brussels ! 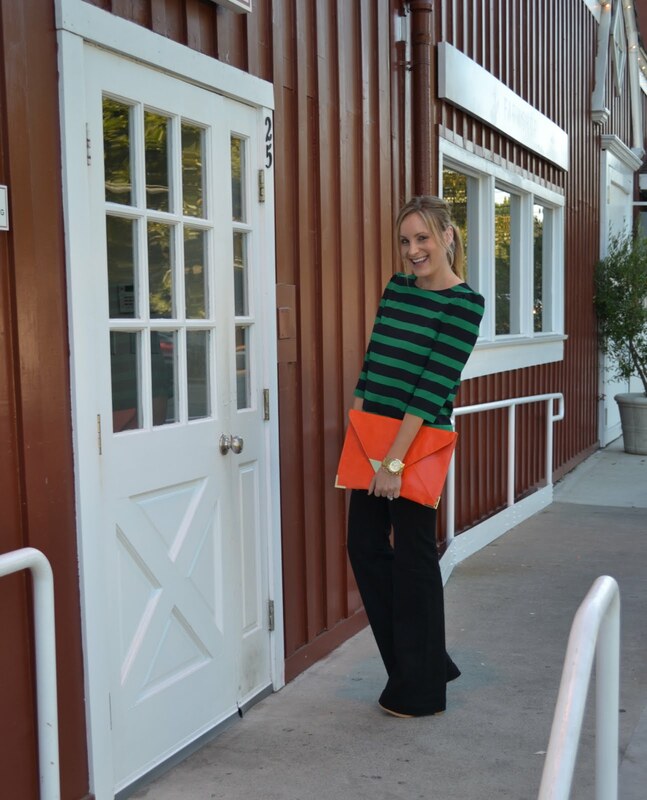 Love the stripes with the orange clutch! Love the entire outfit, comfy yet chic!!! I love your style! gorgeous! I'm in love with that name ring! It makes me want one now! so cute that you've had it forever. Makes it that much better!